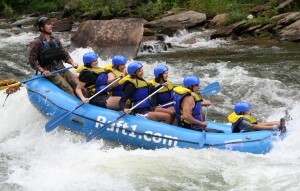 Ocoee River rafting is a great way to enjoy your time in the mountains of Tennessee and North Georgia. Being 15 minutes from Blue Ridge, Georgia and 2 hours from Atlanta, Georgia, we are in the heart of the mountains. The Ocoee River has 2 sections of river to raft. The Upper Ocoee and the Middle Ocoee. You can combine your trips for a full day of fun filled Ocoee Rafting! Click here for more information about Ocoee Rafting.